Easily apply your favorite detailing chemical! 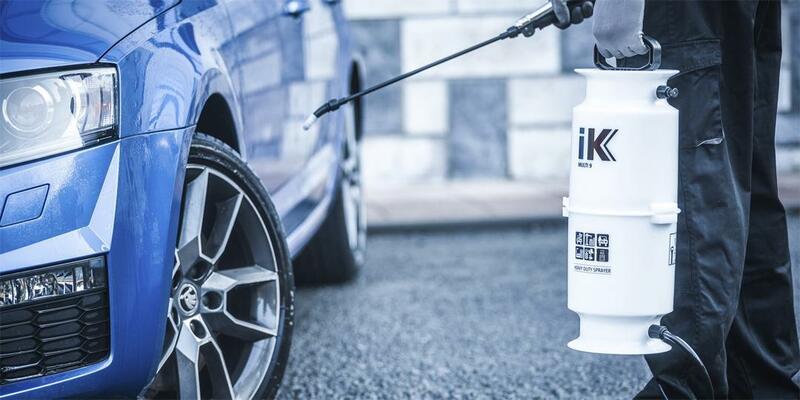 The IK Multi 9 Sprayer will allow you to safely and easily spray your favorite detailing chemical onto the surface! When using a traditional spray bottle, you can quickly become tired when having to pull the trigger over and over. The Multi 9 features a pump at the top of the bottle, allowing you to pump up the pressure and disperse your favorite detailing chemical with the simple push of the thumb trigger on the lance handle. Hold the trigger and the product within the bottle will be dispersed until the pressure in the bottle has been completely released. This not only saves you the effort of multiple trigger pulls, but can save you valuable detailing time as well. This high-quality sprayer can fit 1.58 gallons of cleaner, features a strong translucent tank with indicator level and a unique ergonomic design. Three mixer settings allow for 3 types of foam, select orange for wet foam, grey for medium foam and green for dry and thicker foam. The lance grip and shoulder strap allow for easy maneuverability and spraying. 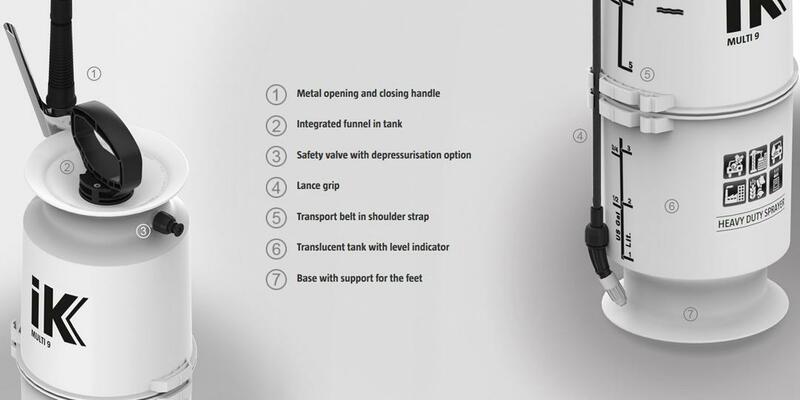 The base has a support for your feet, allow you to pump easily and if you pump too far, the safety valve has a depressurization option for easy pressure release. All of the seals, plastic parts and washers are resistant to most acids and solvents used in chemicals, so this bottle will last. IK rates it for optimal use with disinfectants, neutral products and acids, along with suitable use with solvent-based pesticides, alcohols and oils, solvents and petroleum by-products. 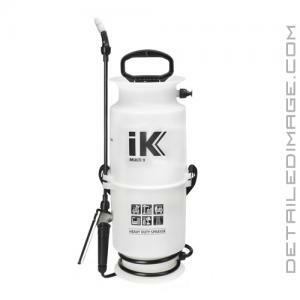 If you are looking for a chemical sprayer, large enough to tackle entire exteriors, the IK Multi 9 Sprayer is a fantastic choice! If you are looking to apply cleaners to smaller areas like wheels or interiors, the IK Multi 1.5 Sprayer may be a better option.